Cereal companies have improved the nutritional quality of most cereals marketed directly to children, but they also have increased advertising to children for many of their least nutritious products, according to a report by the Yale Rudd Center for Food Policy & Obesity. The least healthy breakfast cereals are those most frequently and aggressively marketed directly to children as young as age two, finds a new study from Yale University's Rudd Center for Food Policy and Obesity. The researchers' evaluation of cereal marketing, the first such study of its kind, shows pervasive targeting of children across all media platforms and in stores. Breakfast cereal is a $10 Billion a year business and competition is fierce. Key Cereal FACTS findings are highlighted in this clip. The Today Show reviews cereal marketing practices to children and gets expert opinion from Kelly D. Brownell, who was interviewed for the segment. Cereal FACTS findings were also reported. CBS "Evening News" anchor Katie Couric took to her Notebook vlog to nag parents about the need to keep their kids away from the siren song of sugary cereals. She cites the Rudd Center's Cereal FACTS report. If breakfast is the most important meal of the day, children's cereal may not be worth the time it takes to pour it. A study from Yale University takes a close look at all those cereals aimed at children and finds they contain too much sugar and too little fiber. Cereal FACTS findings are discussed on Good Morning America. Rudd Center Director, Kelly D. Brownell is featured in the segment. Key Cereal FACTS findings are highlighted in this ABC exclusive. Kelly D. Brownell talks about food industry marketing practices and the failure of self-regulatory pledges. The 2012 Cereal FACTS report has unearthed several startling facts regarding how Hispanic children have become the target of sugary cereal marketing. Despite all the attention and research devoted to best practices in children’s health, some of the top foods companies make and market to children are still the least healthy. While most cereals marketed to children have gotten a bit healthier -- lower in sugar and salt and higher in whole grains and fiber -- they still typically contain a spoonful of sugar for every three spoonfuls of cereal. General Mills Inc. and other cerealmakers have improved the nutritional quality of the cereals they market to children, but they also have increased kid-oriented advertising for many of their least-nutritious products. Kids’ cereals are more nutritious than a few years ago, but there are more ads for the least nutritious products. Cereal makers have made progress in improving the nutritional content of cereals marketed to children – but they have also increased child-directed advertising of some of their least nutritious products. Breakfast cereals for children increasingly contain more whole grains and less sugar, but U.S. food companies have focused advertising on their least healthy offerings to kids. U.S. food companies are making breakfast cereal for children healthier by doing cutting sugar and adding whole grains, but they are offsetting those benefits by targeting kids with more ads for their unhealthiest products. Public health organizations may have lost the battle to have the federal government impose stricter food marketing guidelines, but they aren't giving up on their overarching mission. Over the past three years, cereal manufacturers have improved the nutritional content of products marketed to children, but they have also increased advertising aimed at kids for sugary cereals that, despite improvements, still aren’t as nutritious as products aimed at adults. Tony the Tiger, Trix Rabbit and Fred Flinstone are under fire again. 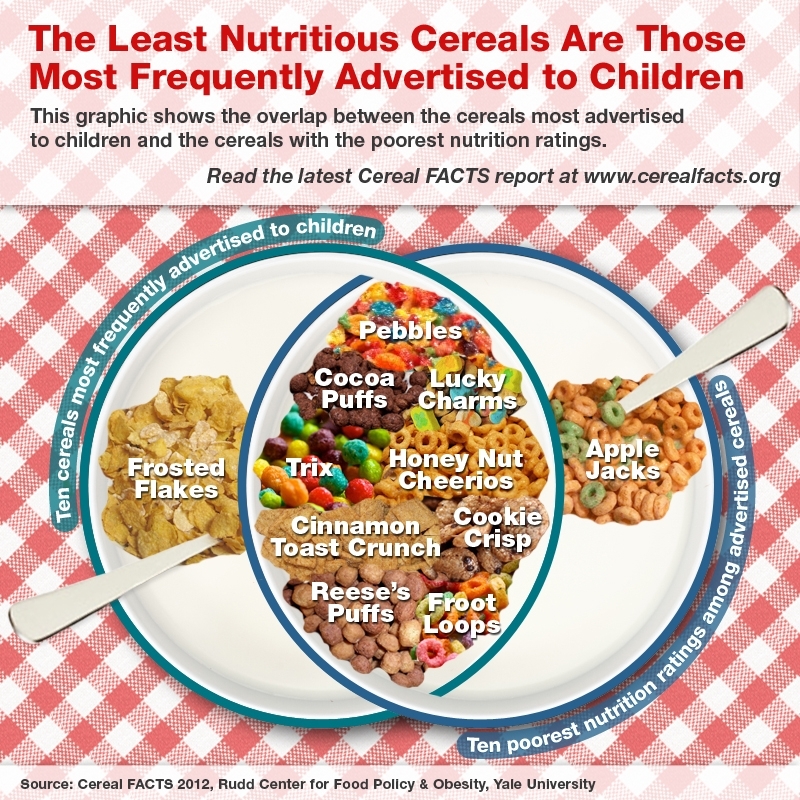 The Rudd Center puts those and other sugary-cereal icons in the cross hairs in a report that criticizes food companies for hiking marketing spending on kid-targeted brands, including aggressive ad investments in "some of their least-nutritious" cereals. The cereal giant General Mills has announced it will cut back the amount of sugar in 10 popular kids' cereals to single-digit grams of sugar per serving. "This is a historic announcement -- it comes on the heels of an investigation by the Connecticut attorney general and the FDA of the 'Smart Choices' program and our own Cereal Report," Rudd Center Director, Kelly D. Brownell, said. General Mills — the maker of Lucky Charms, Trix and Cocoa Puffs — plans to reduce the amount of sugar in its cereals marketed to children. The move comes as many food companies alter their products and face growing scrutiny from consumers, regulators and health groups over the nutritional value of their foods. Popular blogger, Kelly the Kitchen Kop, highlighted Cereal FACTS in a discussion on breakfast cereals for children. A new study by researchers at Yale University’s Rudd Center for Food Policy and Obesity suggests that the least healthy cereals are most aggressively marketed to children, Time magazine reports. Researchers reviewed cereal from 115 brands, identifying 19 that were marketed directly to children on television, the Internet or through licensed characters, such as Dora the Explorer. The least-healthy breakfast cereals are the ones most aggressively marketed directly to children as young as age two, according to a new study from Yale University in New Haven, CT. The study found that cereals marketed directly to children have 85 per cent more sugar, 65 per cent less fiber and 60 per cent more sodium than cereals marketed to adults. Want to Know Just How Sugary Your Kid's Cereal Is? What About Your Own? Reese's Peanut Butter Cups rock. No question. And a whole lot of campers rightly appreciate a good s'more now and then. But then, these are desserts or snacks or treats or whatever you want to call them, not meals. Not for most people. General Mills' Reese's Puffs and Kellogg's Smorz on the other hand pass themselves off -- quite blatantly -- as meals for children. So do many of their kin. And that irritates the researchers at Yale University's Rudd Center for Food Policy and Obesity. A new report warns that most cereals advertised to kids are packed with sugar, which is fueling childhood obesity in the U.S. A study by the Yale University's Rudd Center for Food Policy and Obesity blasts the nutritional value of some of the most advertised kids' cereals. Industry regulation of which cereals are marketed to children allows the least healthy products to be advertised most aggressively, according to a study from Yale’s Rudd Center for Food Policy and Obesity. Sugar + sodium - fiber = a recipe for marketing cereal to children. According to a news study from Yale University’s Rudd Center for Food Policy and Obesity, the least healthy cereals are those most aggressively marketed directly to children, including TV ads, online game and in-store displays. Six hundred and forty-two times a year. That is how often the average American preschooler sees an advertisement for cereal, according to a new study by Yale University. So it puts things in perspective when the same study says that cereals with the biggest marketing push also happen to be among the least nutritious, when analyzed using a nutrient profiling system developed at Oxford University. Which Cereals Do Companies Push Hardest? The Sugary Ones! Companies may argue that sugary cereals are good because they encourage kids to drink milk, but the Rudd Center researchers have shown that kids are happy to eat non-sweetened cereals. Furthermore, if they add their own sugar, they are putting in less than the cereal companies put in. A new study confirms what savvy consumers have long suspected: Most breakfast cereals advertised to kids are chockfull of sugar and low on fiber. Before food politics became a Wikipedia entry and the title of a book, before anyone cared about trans fat or realized we were in the midst of a pediatric-obesity epidemic, Lucky Charms were simply magically delicious. Now the cereal, along with other childhood favorites like Corn Pops and Cocoa Pebbles, is being labeled a public-health menace by health researchers at Yale University. Mark Bittman from the New York Times provides readers with links to interesting articles. The Rudd Center's Cereal FACTS 2012 report was highlighted. Can Parents Trust Cereal Companies? As a researcher, I know the importance of making sure children eat breakfast. Children who eat breakfast have better nutrition, do better in school and are less likely to be overweight than children who skip the first meal of the day. But as a mother of three, I also know how hard it can be to get your children to actually eat breakfast. Mornings are hectic and my three teenage girls are more concerned about their clothes and hair than their calcium and fiber. Healthy ready-to-eat cereals are a great option. Cereal marketing to children in 2012 looks much the same as it did in 2009. In 2009, it was easy to quantify the degree to which the companies promoted their healthiest cereals to children -- there was none. How much is there today? None. Cereal companies continue to push their least nutritious products -- Froot Loops, Reese's Puffs, Fruity Pebbles, Lucky Charms -- directly to children. Children also continue to see more advertising for cereals than for any other category of packaged food or beverage. Despite their participation in the Children’s Food and Beverage Advertising Initiative, a self-regulatory industry group pledged to reduce the marketing of unhealthy products to children, the food industry continues to aggressively promote its least nutritious cereals to children.